If I could whizz back in time ten years and tell myself what I should focus on in my English lessons then I'd say two things. One - learn phonetics, teach them to your students, and really help with their pronunciation. Two - focus on vocabulary, make students record new vocabulary, revise vocabulary, and test vocabulary. Over my teaching career I haven't concentrated enough on vocabulary. I'm not sure whether it's because the academy I work for is more grammar focused, but my input on vocabulary has been random. I'd miss out vocabulary sections in the book over grammar, wouldn't talk enough about the importance of recording vocabulary, and would rarely revise vocabulary from previous lessons. Now my focus has changed dramatically. I still teach grammar; we wouldn't want students to fail their grammar exams, would we? But I spend a lot more time teaching and revising new vocabulary. At the start of this term I told all my classes about Barry's Theory on English. It's not that revolutionary, but it made my students think and seems to have had an effect. "What two things can help you improve your skills in reading, listening, writing, and speaking?" I asked. "Study," said Paco, raising his hands and making the speech marks signal. Giggles followed. "Of course you need to study," I said, copying his imitation, "but something more important." "Listen to you," said Javi. "Yes Javi, well done, but something else." "Not bring in our mobile phones," said Juan. Sniggers echoed. "You can bring your phones; you just can't look at them. No, come on people, here, two words," I said, writing, p_________ and v_______ on the board. Eventually they got it: pronunciation and vocabulary. “But how does pronunciation help to read?” asked Paco, grinning at the back. “You look in the dictionary?” said Juan. “You say in Spanish,” said Paco. “You say in Spanish?” said Paco. “Exactly, and you get lost, but if you knew the word? And finally, when you're writing and you want to express yourself better, but haven’t got a dictionary, what do you do?” Paco went to open his mouth. I raised my eyebrows. He remained silent. “You see my point. 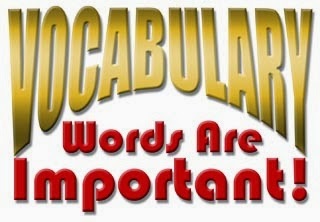 You see how important vocabulary is?” Most of the class nodded. Something seemed to have clicked in some of their brains. One kid glanced at his mobile to check the time. It won't work for everyone. So that’s my theory on English. Lots of work on vocabulary will improve students’ level in all areas. I once read that for a student to get a decent mark at FCE they need a vocabulary base of about 5,000 words, which I try to slip into my lessons now and then. That's the easy part. The hard part is actually getting them to improve. I’ll be doing some blogs in the New Year on how to teach vocabulary, ways to record and revise vocabulary, and also loads of vocabulary activities. In the meantime, here are a few articles that might be of interest. Why vocabulary is so important?